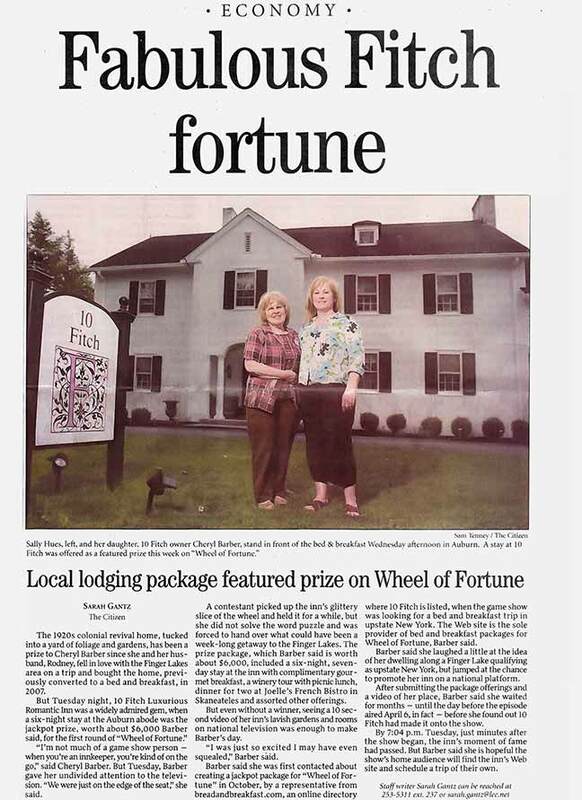 April 13 – A 6 night stay prize package from 10 Fitch appeared as a prize package on Wheel of Fortune for a third time. Ryan Levine of Hastings MN won the prize package, including accommodations at 10 Fitch, air fare furnished by bedandbreakfast.com, dinner one evening furnished by Joelle’s French Bistro in Skaneateles, a chauffeured winery/sightseeing tour with picnic lunch partially furnished by Finger Lakes Limousine & Coach, and much more with a retail value of over $6000. Ryan and his wife Sammy enjoyed their stay with usbeginning July 18th and returned to Minnesota on the 24th. Lanierbb.com readers have voted and 10 Fitch has been awarded the Best for Nearby Winery in Guests’ Greatest Picks Award program out of 8,500 B&B’s world wide! August 4, 2010 – Travel writers Arthur & Lyn Dobrin came and stayed two days with us last month and have written a very nice article about 10 Fitch for About.com Honeymoons/Romantic Travel. They had opportunity to visit many of the wonderful things to see and do in the Auburn area while here and have included comments on their entire experience. rerracurve: The Guide To Responsible Travel – Bed and Breakfasts: fun, sustainable and romantic! Budget Travel GG Summer 2007 Issue – GG SUMMER 2007 ISSUE : Finger Lakes Expedia’s B&B aggregator, bedandbreakfast.com, lists more than 160 different deals nationwide that are aimed at women. You can find them on the website in its specialty packages section. One of our favorites is in New York’s Finger Lakes area: Two nights at the 10 Fitch; a one-hour massage per person; arrival reception with hors d’oeuvres and cold beverages; a seven-hour limo tour of Finger Lakes wineries and stores, with a picnic lunch; a private cookout with a fire pit for roasting marshmallows; and breakfast daily.